Aquariums have become focal points in homes. Professional saltwater aquariums often have huge filter systems or need special insertion into your walls. Aquaria brings you a 6mm thick professional bent glass table top tank with a professional grade internal filtration system, plus gorgeous style. Its modern design makes it aesthetically appealing. Its features, such as the adjustable flow nozzle, daylight and moonlight LED lighting, and sleek curved glass corners, showcase its functionality. The key to keeping your fish happy and healthy is a clean tank. Ericka Basile, founder of Aquaria Designs, is a marine advocate and microbiologist. She developed this luxury line of desktop tank kits. Water maintenance, water testing and water changes are a need for any tank. With the Aquaria, the internal filter system is easy to access from the top, which allows for comfortable water testing. The lights are special- you can have live coral in your tank. And the blue nighttime light makes the water simply shimmer - just as if you are under the ocean scuba diving. 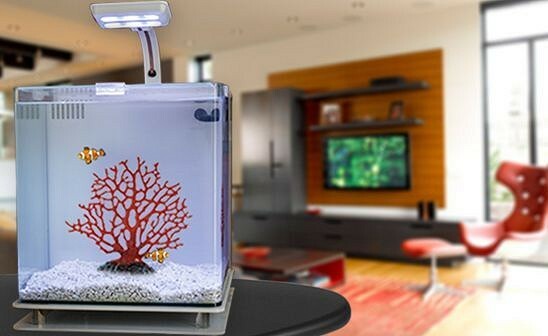 Not a saltwater aquarium fan? Enjoy the Aquaria as a freshwater tank just as easily. The nice thing is the tank can grow and change along with your hobby needs. The aquarium comes with key supplies you will need to create a healthy environment for your fish: quick start water conditioning solution, water quality testing strips, and 6 replacement filters. Rocks and coral not included. Aquariums have become focal points in homes. Professional saltwater aquariums often have huge filter systems or need special insertion into your walls. Aquaria brings you a 6mm thick professional bent glass table top tank with a professional grade internal filtration system, plus gorgeous style. Its modern design makes it aesthetically appealing. Its features, such as the adjustable flow nozzle, daylight and moonlight LED lighting, and sleek curved glass corners, showcase its functionality. The key to keeping your fish happy and healthy is a clean tank. 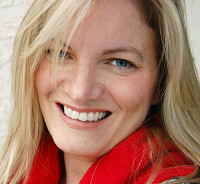 Ericka Basile, founder of Aquaria Designs, is a marine advocate and microbiologist. She developed this luxury line of desktop tank kits. Water maintenance, water testing and water changes are a need for any tank. With the Aquaria, the internal filter system is easy to access from the top, which allows for comfortable water testing. The lights are special- you can have live coral in your tank. And the blue nighttime light makes the water simply shimmer - just as if you are under the ocean scuba diving. Not a saltwater aquarium fan? Enjoy the Aquaria as a freshwater tank just as easily. The nice thing is the tank can grow and change along with your hobby needs.